Once again, I am conflicted about this time of year. I’m a sucker for Easter décor. I’ll take a basket of eggs and grass over a fat Santa any day. I love the bright colors and the baby farm animals. 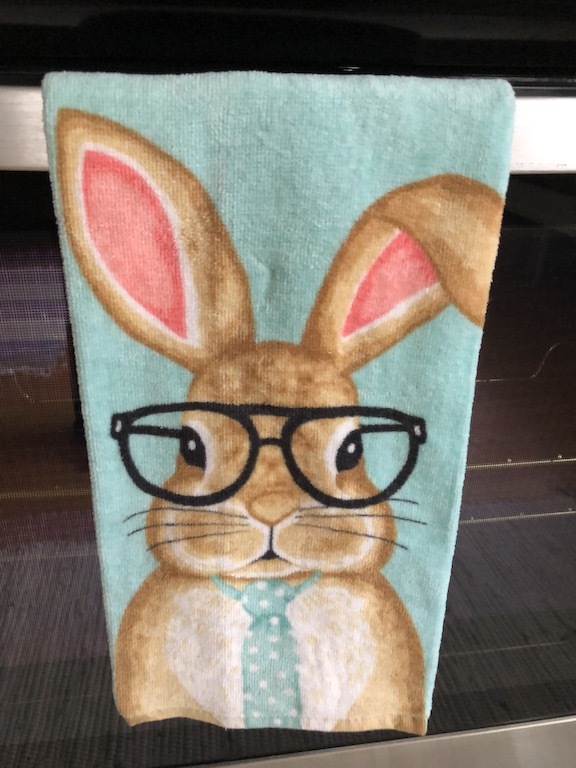 So of course, when my daughter and I were shopping last week and I saw this kitchen towel (see picture), I had to have it. Too cute, don’t you think? Or “kind of weird “ is more like it. However, it fits perfectly with my other decorations, which by the way are still in the basement. I have pulled the “Easter” bin off the shelf and opened the lid but just don’t feel right bringing out the bunnies and eggs just yet. This is where the conflict comes in. It all started one Good Friday quite a few years ago. I had never heard anyone talk about grieving the death of Jesus, like he was a family member or dear friend. I slid over physically and something in me slid over spiritually. That encounter had a powerful effect on me. I didn’t really know it at the time but it stuck with me and moved me another space on my path to knowing Jesus more intimately. I still can’t fully wrap my head around the immensity of the love He has for us and the depth of the sacrifice Jesus made for us because of that love. But I know He does and I know He did and now I grieve. These next few weeks are a bit more somber for me than they used to be. There is a thin pall over things, a touch of melancholy. Thus the conflict. But I remind myself the story doesn’t end on Good Friday. Alongside the nails, in the midst of the sorrow and pain there is the hope and promise of new life, of resurrection, of bunnies and colorful eggs. Think of Jesus as your friend. Find him in your spot. Thank him for what he is about to do for you. Grieve a bit then honor His sacrifice by living fully alive in His love.